I recently took a dialect quiz. The point of the quiz was to demonstrate how differently people across the United States speak the English language. The quiz was scarily accurate... it identified my hometown and my parents' hometown as the places I'm most likely from. You should check out the quiz at this link. One of the questions was how I pronounced "caramel." Am I the only one who completely ignores the middle "a"? I say "CAR-ml." Anyway, these cupcakes were a fun experiment for my husband's work luncheon. 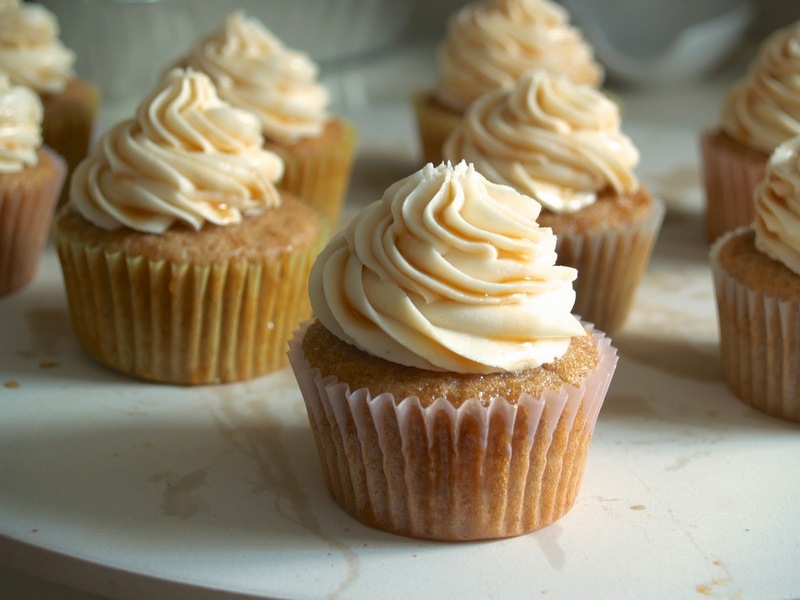 It was Harry Potter themed, so I wanted to go with something along the lines of butterbeer cupcakes. 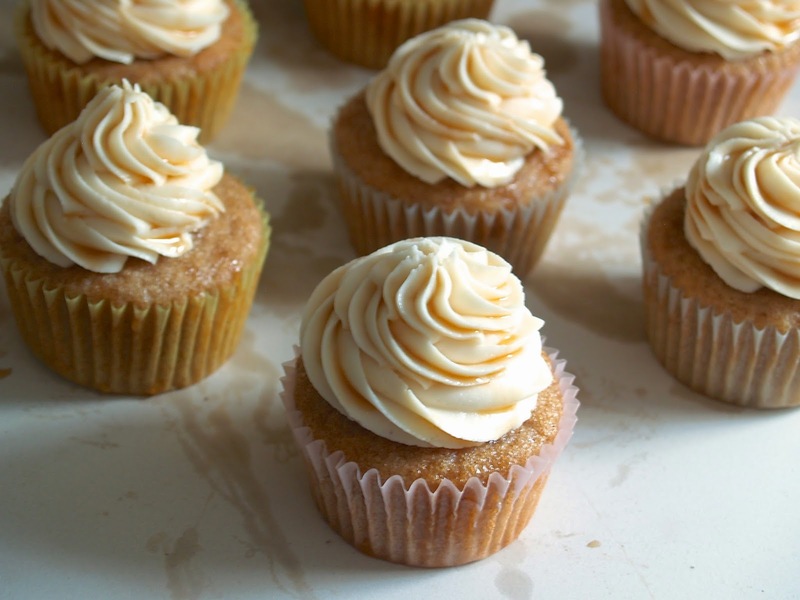 I adapted the cupcake recipe from Natasha's Kitchen, and I invented the frosting recipe. 1. Preheat the oven to 350 degrees fahrenheit. Line cupcake pans with 15 cupcake papers. Whisk together the flour, cornstarch, baking powder, baking soda, salt, and cinnamon. Whisk for about 1 minute. You want to get everything really well incorporated. 2. In the bowl of a stand mixer, beat together the eggs with the sugar for about 30 seconds. Add the vanilla and oil, then beat for 15 seconds. 3. Add the flour mixture and buttermilk slowly, alternating between the two. Use a cookie scoop to divide the batter evenly among the 15 cupcake papers. I filled my cupcake paper halfway up the paper. 4. Bake 12-14 minutes, or until a toothpick or cake tester comes out clean. 1. Beat the slightly softened butter for about 1 minute in the stand mixer. Add the caramel sauce. 2. Slowly add the powdered sugar, then add the vanilla. You may need a few teaspoons of milk or cream to thin the frosting out enough to pipe it. Let the cupcakes cool. 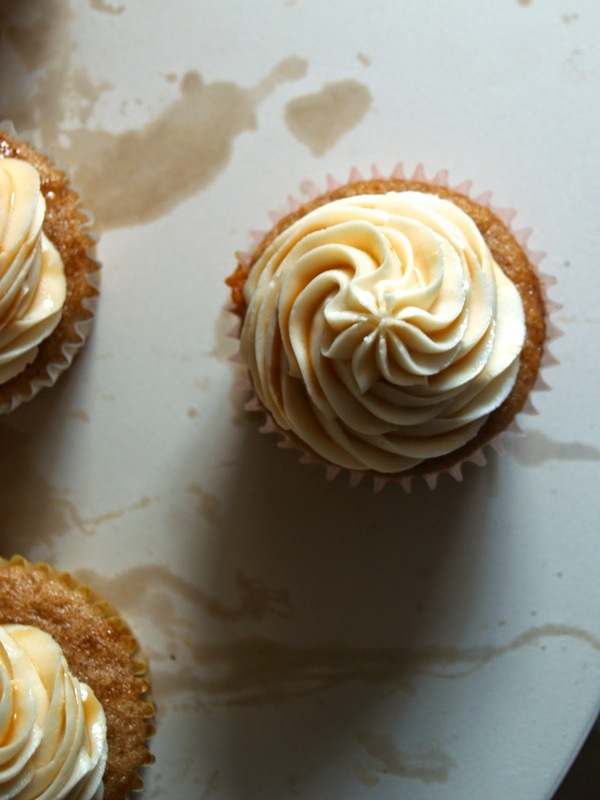 Use a very small round piping tip to fill cupcakes with the caramel sauce. Pipe frosting onto the cupcakes using a closed star tip. Drizzle with leftover caramel sauce. Enjoy! My wonderful husband got me a fancy frosting piping bag and giant cupcake coupler for my birthday. Most useful present ever!